Here's my card for this week's Muse challenge, which is Therese's final challenge with us. I focused on the colours, and tried to use similar elements - a white frame, blue sky, yellow/orange image and elements on the grey card base, as well as the simple black sentiment. I used a Papertrey frame die, with the centre portion sponged with a variety of blue distress inks. I can not remember where the sun die came from, but I sponged it in yellow and orange, stacked it up and added a little bit of yellow Stickles. I popped all this up over some clouds (also unknown) cut in the same colour as the card base. I finished it with a CASual Fridays sentiment. I know you all join me in thanking Therese for all her inspiration and hard work for Muse over the last couple of years and also in wishing her all the best in her future endeavours! The deadline for this week's challenge is Monday at 8 am. Voting will start at that time and continue until Tuesday at 8. Results will be posted at noon on Tuesday. Hope to see you there! Your sun is just spectacular - great sponging. And the gray clouds are a cool backdrop. I love your interpretation of the inspiration photo. 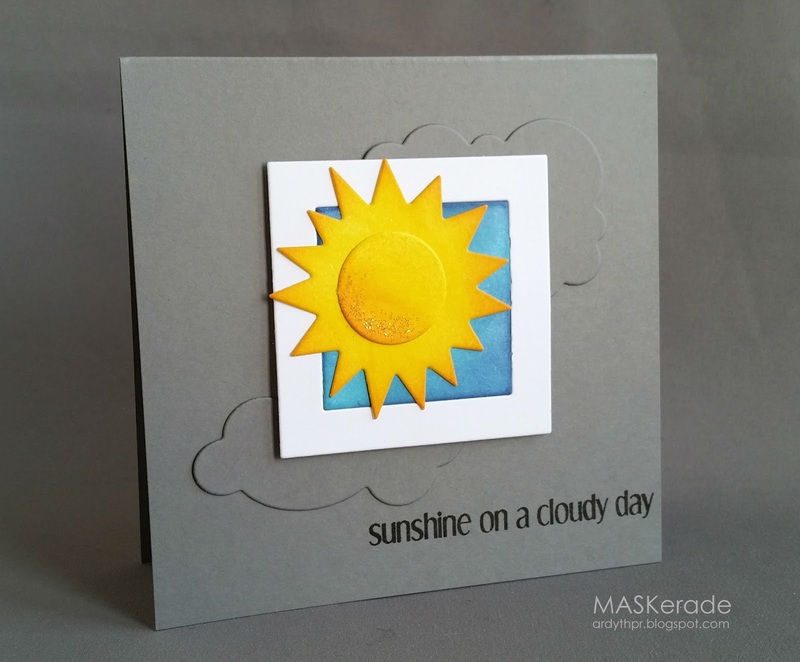 What a fabulous interpretation of that adorable inspiration card! Oh Ardyth, this is simply divine. Seriously I am in love... am I allowed to be inspired by your inspired by design? Because I just might have to be! This card is ALL. ABOUT. THE. EFFECT! Seriously stunning contrast between the muted shade of the grey and the boldness of the yellow and blue...both sponged to perfection! The yellow stickles - perfect! Love love love your sunny take on the card. Oh my, I'm really going to miss you guys, did I tell you that you are incredible!! Such a sunny card - and your usual fantastic CAS take on things - amazing how you do it! So sweet and just the right card to put a smile on a sweet friends face. LOVE it, the sun's coloring and the blue background. I so look forward to your inspired cards off the Muse. This [as usual] is fabulous!! Oh how rich great looking dichotomy, Ardth! This is such a perfect card for the Muse! Love it! I think I've said it before but I'll say it again. I love how you are able to break down a design into it's basic elements and then create a completely different card that still has the feel of the original. It's really awesome!